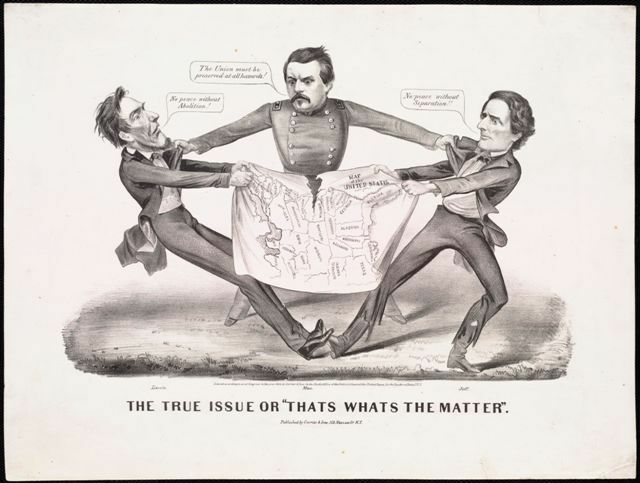 The Grolier Club (47 East 60th Street) is currently hosting Torn in Two: The 150th Anniversary of the Civil War, an exhibition of contemporary maps, broadsides, photographs, and documents organized by the Norman B. Leventhal Map Center of the Boston Public Library. The exhibit is small--it takes up just one room on the club's ground floor--but provides a fascinating glimpse into the attitudes and reportage of the time. The exhibition pulls the viewer in immediately: the first case shows the first American demographic map (based on the 1860 census), which records the percentage of slaves relative to the population in each slave-holding county. In some counties near the Mason-Dixon line, that percentage was close to zero; in other counties in the Deep South and Texas, it reached nearly 90%. Lincoln evidently spent a great deal of time studying the map, and in a later portrait of him signing the Emancipation Proclamation, a copy of the map can be seen in the background. Other displays include railroad maps, political cartoons, photographs, and commemorative diagrams--produced by the daily newspapers--of famous battle sites. For anyone interested in the Civil War, which the exhibition notes is still the most important moment in our nation's history, this jewel of an exhibition is a must-see. 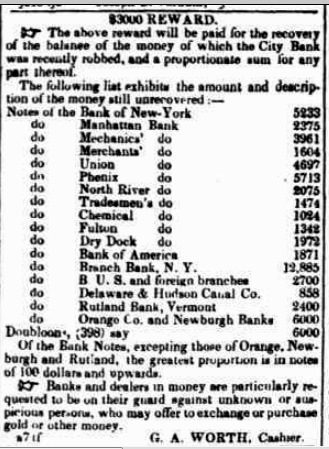 When workers arrived at the City Bank at 52 Wall Street* on Monday, March 21, 1831, they were in for a rude shock. Sometime over the weekend—probably the evening of March 19 or the early morning hours of March 20—the bank had been robbed of $245,000 in bank notes and Spanish doubloons. This was New York’s first-ever bank heist. Though suspicion immediately fell on workers at the bank, the police had little time to investigate the employees before they received a tip from Mr. Bangs, the proprietor of a “respectable private boarding house” (according to the New-York Evening Post) who was leery of his newest tenant. On the Monday following the robbery, a man calling himself Mr. Jones had arrived at Mr. Bangs's boarding house on Elm Street** with three small trunks, asking for a private room in which to write. He paid for the room in advance. After a few days, the landlord became suspicious over Mr. Jones’s apparent anxiety, especially concerning the contents of his trunks. When one of the trunks disappeared, Mr. Bangs contacted the police. The police—seemingly without probable cause or a warrant—picked the locks of the two remaining trunks and found bank notes they could positively identify as being from the City Bank robbery. 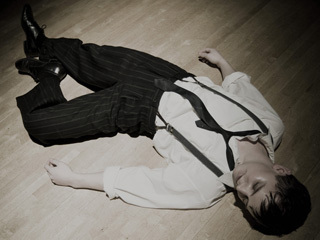 When Mr. Jones returned to the boarding house, he was promptly arrested. The robber was soon discovered to be Edward Smith, who lived on Division Street with his wife and two children and ran a shoe store. He was well-known to police, having been arrested for a store robbery in Brooklyn but not convicted due to lack of evidence. 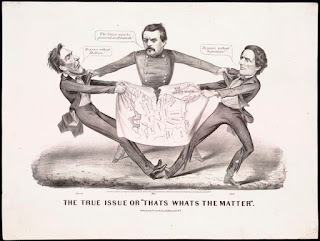 Stories soon began to swirl of other robberies Smith was allegedly connected to, including the attempted theft of cash from the steamer Chancellor Livingston and a daring mail coach heist in England. Of the $245, 000, only about $176,000 was recovered from Smith. The bank soon began advertising for people to keep an eye out for the other bank notes (and the Spanish doubloons). One apparent accomplice was arrested in Philadelphia in April when some of the missing bank notes were identified on his person. But it is unclear if the remainder of the money was ever recovered or if that man was, indeed, part of the robbery. A jury found Edward Smith guilty in a one-day trial (that one day included jury selection, testimony, and deliberations) and he was sentenced to five years hard labor in Sing-Sing prison. * City Bank (aka The National City Bank) had been founded on this spot in 1812. At the turn of the 20th-century it would move across the street into the old Merchant's Exchange building at 55 Wall Street, now Cipriani. City Bank is today Citibank. ** Elm Street is now Lafayette Street. 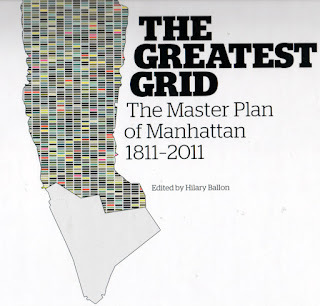 We were recently sent a copy of The Greatest Grid: The Master Plan of Manhattan 1811-2011, the companion book to the exhibit of the same name at the Museum of the City of New York. The book is richly illustrated with images from the show, including a fold-out copy of the original Commissioners’ Plan of 1811, which gridded Manhattan into streets and avenues up to 155th Street. 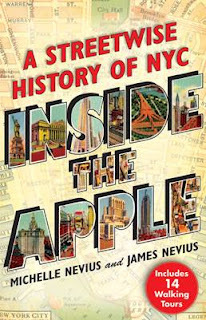 Like the exhibition, the book tells the story of New York’s development from the era before the grid, through the city’s explosive growth in the mid-19th century and the development of the Upper East and Upper West Sides, and on to today. The material is at its strongest in the era between 1811 and 1900. The Greatest Grid features many detail maps, including some of the Randel Farm Maps, which remain among the most valuable insights into early 19th-century New York. Created by John Randel, the key surveyor of the Commissioners’ Plan, the farm maps show property lines, topographical features, and other key details at a scale of 100 feet to the inch. Noted Manhattan chronicler I.N. Phelps Stokes called them "the most complete and valuable topographical record of the period that exists." Also revealing are photographs from later in the century that show just how long it took the city to expand into the grid that Randel had laid out. The photo above is the view looking north from the Dakota apartments, ca. 1890. 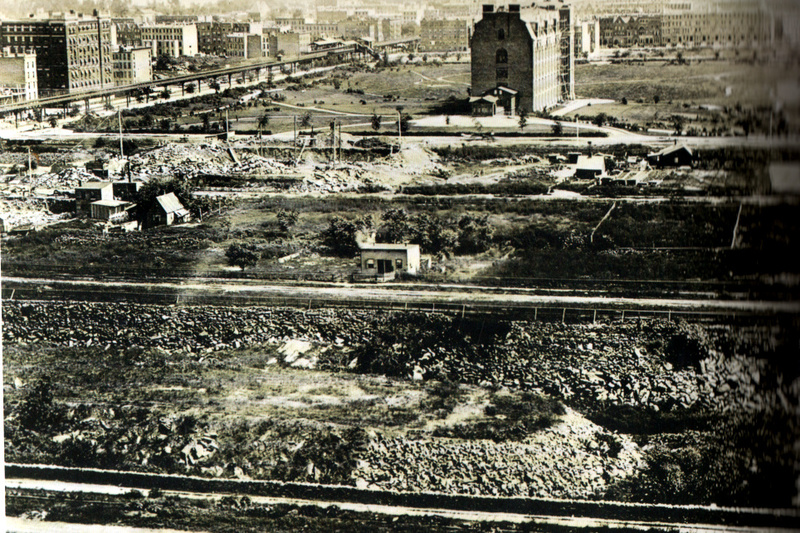 The only major structure visible is the American Museum of Natural History, which had opened a few years earlier. 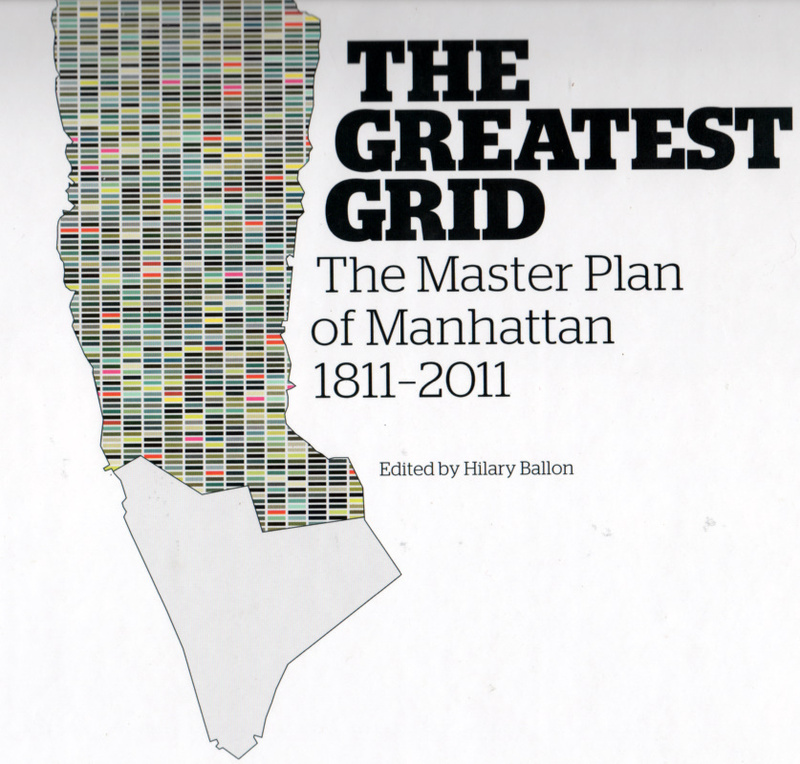 The Greatest Grid, skillfully edited by NYU Urban Studies professor Hilary Ballon, is packed with nuggets of information—what spurred the development of a grid plan; why Broadway works against the grid; how the area north of 155th Street faced unique topographical information. Some things are given short shrift—we would have liked more information on the Flatiron Building, for instance, or the development of Times Square—but these are minor quibbles. This is a title well worth owning for anyone who appreciates Manhattan’s past and wants to explore it in greater depth. Curious and Unusual Deaths: "Death in New York"
Each episode of the show explores the circumstances of three people who died in strange ways. The show combines reenactment with interviews with scientists, historians, and engineers who examine these accidents to try to figure out not only how they happened, but how we can learn from these tragedies. In "Death in New York," the three tales concern a city worker who was sucked into a drainage pipe at the Jerome Park Reservoir in the Bronx, a woman killed by a steam explosion while taking a nap near Gramercy Park, and a sidewalk electrocution in the East Village. The program has been very well-received; for recent reviews of the show, please see the New York Times and Huffington Post. In Canada, the show airs on Discovery Canada, and our episode will premiere on Friday, March 23, at 10:30PM ET. The show is also shown in other markets around the world, so do keep an eye out for it. We haven't actually seen our episode yet, but are eager to find out how we did (and how much was left on the cutting room floor). Hope you have a chance to tune in, too! Today marks the centennial of one of the greatest confectionery successes of all time: the Oreo cookie, which was invented in New York City in 1912. The year 1898 saw two mergers that shaped the rest of the 20th century: the unification of the five boroughs of New York City, and the merger of the American Biscuit & Manufacturing Company and the New York Biscuit Company into the National Biscuit Company—Nabisco. In 1906, the company moved its national headquarters to the New York Biscuit company’s factory between Ninth and Tenth Avenues in West Chelsea, having recently introduced two bestsellers: the Uneeda Biscuit and Barnum’s Animal Crackers, which were not endorsed or authorized by the circus. 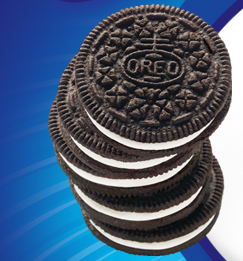 In 1912, the factory created its most famous confection, a disc-shaped, cream-filled cookie dubbed the Oreo. No one at Nabisco knows where the name came from, though etymologists have suggested everything from or (French for gold, and perhaps a reference to the fact that the cookie originally also came in a lemon meringue flavor) to the Greek oreos for mountain (because early cookies had a mound of filling). Some have even suggested that the “re” in the middle is the cREam and the “o” on either side is the chOcolate, but that seems like wishful thinking. Perhaps the simplest explanation is correct: Oreo just sounded like a good name for a cookie. To date, close to 500 million Oreos have been sold, making it the most popular cookie in the U.S. The Nabisco factory where the Oreo was born is now Chelsea Market, which features food stores, boutiques, and our favorite TV station, NY1. Soon after the Oreo's introduction, Nabisco expanded its bakery across Tenth Avenue, using the freight railroad there to ship millions of cookies. 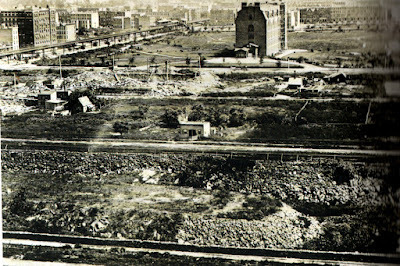 That freight line is now the High Line, one of New York's most celebrated outdoor green spaces. 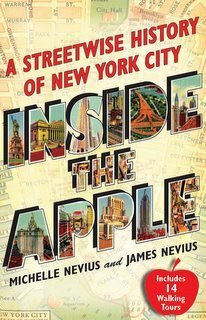 and Chelsea in Inside the Apple: A Streetwise History of New York City. Follow us on Twitter or Facebook or have these blog posts emailed to you directly.